This article is about the geographical area. 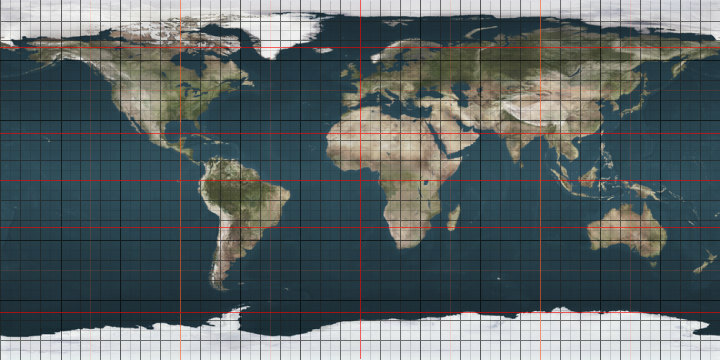 For other uses, see Horse latitudes (disambiguation). Horse latitudes, subtropical ridges or subtropical highs are the subtropical latitudes between 30 and 35 degrees both north and south where Earth's atmosphere is dominated by the subtropical high, an area of high pressure, which suppresses precipitation and cloud formation, and has variable winds mixed with calm winds. It is the product of the global air circulation cell known as the Hadley Cell. The subtropical ridge is characterized by mostly calm winds, which act to reduce air quality under its axis by causing fog overnight, and haze during daylight hours as a result of the stable atmosphere found near its location. The air descending from the upper troposphere flows out from its center at surface level toward the upper and lower latitudes of each hemisphere, creating both the trade winds and the westerlies. The subtropical ridge moves poleward during the summer, reaching its most northern latitude in early fall, before moving equatorward during the cold season. The El Niño southern climate oscillation (ENSO) can displace the northern hemisphere subtropical ridge, with La Niñas allowing for a more northerly axis for the ridge, while El Niños show flatter, more southerly ridges. The change of the ridge position during ENSO cycles changes the tracks of tropical cyclones that form around their equatorward and western peripheries. As the subtropical ridge varies in position and strength, it can enhance or depress monsoon regimes around their low-latitude periphery. The horse latitudes are associated with the subtropical anticyclone. The belt in the Northern Hemisphere is sometimes called the "calms of Cancer" and that in the Southern Hemisphere the "calms of Capricorn". The consistently warm, dry, and sunny conditions of the horse latitudes are the main cause for the existence of the world's major non-polar deserts, such as the Sahara Desert in Africa, the Arabian and Syrian deserts in the Middle East, the Mojave and Sonoran deserts in the southwestern United States and northern Mexico, all in the Northern Hemisphere; and the Atacama Desert, the Kalahari Desert, and the Australian Desert in the Southern Hemisphere. A likely and documented explanation is that the term is derived from the "dead horse" ritual of seamen (see Beating a dead horse). In this practice, the seaman paraded a straw-stuffed effigy of a horse around the deck before throwing it overboard. Seamen were paid partly in advance before a long voyage, and they frequently spent their pay all at once, resulting in a period of time without income. If they got advances from the ship's paymaster, they would incur debt. This period was called the "dead horse" time, and it usually lasted a month or two. The seaman's ceremony was to celebrate having worked off the "dead horse" debt. As west-bound shipping from Europe usually reached the subtropics at about the time the "dead horse" was worked off, the latitude became associated with the ceremony. An alternative theory, of sufficient popularity to serve as an example of folk etymology, is that the term horse latitudes originates from when the Spanish transported horses by ship to their colonies in the West Indies and Americas. Ships often became becalmed in mid-ocean in this latitude, thus severely prolonging the voyage; the resulting water shortages made it impossible for the crew to keep the horses alive, and they would throw the dead or dying animals overboard. A third explanation, which simultaneously explains both the northern and southern horse latitudes and does not depend on the length of the voyage or the port of departure, is based on maritime terminology: a ship was said to be 'horsed' when, although there was insufficient wind for sail, the vessel could make good progress by latching on to a strong current. This was suggested by Edward Taube in his article "The Sense of "Horse" in the Horse Latitudes" (Journal of Geography, October 1967). He argued the maritime use of 'horsed' described a ship that was being carried along by an ocean current or tide in the manner of a rider on horseback. The term had been in use since the end of the seventeenth century. Furthermore, The India Directory  in its entry for Fernando de Noronha, an island off the coast of Brazil, mentions it had been visited frequently by ships "occasioned by the currents having horsed them to the westward". Heating of the earth near the equator leads to large amounts of convection along the monsoon trough or Intertropical convergence zone. This air mass rises to the lower stratosphere where it diverges, moving away from the equator in the upper troposphere in both northerly and southerly directions. As it moves towards the mid-latitudes on both sides of the equator, the air cools and sinks. The resulting air mass subsidence creates a subtropical ridge of high pressure near the 30th parallel in both hemispheres. At the surface level, the sinking air diverges again with some returning to the equator, completing the Hadley circulation. This circulation on each side of the equator is known as the Hadley cell and leads to the formation of the subtropical ridge. Many of the world's deserts are caused by these climatological high-pressure areas. The subtropical ridge starts migrating poleward in late spring reaching its zenith in early autumn before retreating equatorward during the late fall, winter, and early spring. The equatorward migration of the subtropical ridge during the cold season is due to increasing north-south temperature differences between the poles and tropics. The latitudinal movement of the subtropical ridge is strongly correlated with the progression of the monsoon trough or Intertropical Convergence Zone. Most tropical cyclones form on the side of the subtropical ridge closer to the equator, then move poleward past the ridge axis before recurving into the main belt of the Westerlies. When the subtropical ridge shifts due to ENSO, so will the preferred tropical cyclone tracks. Areas west of Japan and Korea tend to experience many fewer September–November tropical cyclone impacts during El Niño and neutral years, while mainland China experiences much greater landfall frequency during La Niña years. During El Niño years, the break in the subtropical ridge tends to lie near 130°E, which would favor the Japanese archipelago, while in La Niña years the formation of tropical cyclones, along with the subtropical ridge position, shift west, which increases the threat to China. In the Atlantic basin, the subtropical ridge position tends to lie about 5 degrees farther south during El Niño years, which leads to a more southerly recurvature for tropical cyclones during those years. When the Atlantic Multidecadal Oscillation's mode is favorable to tropical cyclone development (1995–present), it amplifies the subtropical ridge across the central and eastern Atlantic. Mean July subtropical ridge position. When the subtropical ridge in the northwest Pacific is stronger than normal, it leads to a wet monsoon season for Asia. The subtropical ridge position is linked to how far northward monsoon moisture and thunderstorms extend into the United States. The subtropical ridge across North America typically migrates far enough northward to begin monsoon conditions across the Desert Southwest from July to September. When the subtropical ridge is farther north than normal towards the Four Corners, monsoon thunderstorms can spread northward into Arizona. When the high pressure moves south, its circulation cuts off the moisture and the atmosphere dries out across the Desert Southwest, causing a break in the monsoon regime. On the subtropical ridges western edge (eastern coast of continents), the high pressure cell creates a southerly flow of tropical air toward the lower east sides of continents in the summer months. In the United States the subtropical ridge Bermuda High helps create the hot, sultry summers with daily thunderstorms typical of the Gulf and Atlantic states. This flow pattern also occurs on the eastern coasts of continents in other subtropical climates such as South China, southern Japan, central-eastern South America, southern Queensland and KwaZulu Natal province in South Africa. When surface winds become light, the subsidence produced directly under the subtropical ridge can lead to a buildup of particulates in urban areas under the ridge, leading to widespread haze. If the low level relative humidity rises towards 100 percent overnight, fog can form. ^ "World Wide Words". 2008. ^ Horsburgh, James (1836). India Directory, or, Directions For Sailing To And From The East Indies, China, Australia, Cape of Good Hope, Brazil and the Interjacent Ports... London: W. H. Allen. ^ Roger Graham Barry, Richard J. Chorley (1992). Atmosphere, weather, and climate. Routledge. p. 117. ISBN 978-0-415-07760-6. Retrieved 2009-11-09. ^ Joint Typhoon Warning Center (2006). 3.3 JTWC Forecasting Philosophies. United States Navy. Retrieved on 2007-02-11. ^ M. C. Wu, W. L. Chang, and W. M. Leung (2003). Impacts of El Nino-Southern Oscillation Events on Tropical Cyclone Landfalling Activity in the Western North Pacific. Journal of Climate: pp. 1419–1428. Retrieved on 2007-02-11. ^ Dr. Gerald Bell, Dr. Muthuvel Chelliah, Dr. Kingste Mo, Stanley Goldenberg, Dr. Christopher Landsea, Eric Blake, Dr. Richard Pasch (2004). NOAA: 2004 Atlantic Hurricane Outlook. Climate Prediction Center. Retrieved on 2007-02-11. ^ C.-P. Chang, Yongsheng Zhang, and Tim Li (1999). Interannual and Interdecadal Variations of the East Asian Summer Monsoon and Tropical Pacific SSTs. Part I: Roles of the Subtropical Ridge. Journal of Climate: pp. 4310–4325. Retrieved on 2007-02-11. ^ Myanmar government (2007). Haze. Archived 2008-02-24 at the Wayback Machine Retrieved on 2007-02-11. ^ Robert Tardif (2002). Fog characteristics. Archived 2011-05-20 at the Wayback Machine University Corporation for Atmospheric Research. Retrieved on 2007-02-11. Horse latitudes entry in The Columbia Electronic Encyclopedia, Sixth Edition. New York: Columbia University Press, 2003. "Horse Latitudes" . Encyclopædia Britannica (11th ed.). 1911. Look up horse latitudes in Wiktionary, the free dictionary. This page was last edited on 31 January 2019, at 17:08 (UTC).